Payment Plans starting as low as $129 a month! Whether you are coming to see an orthodontist for the first time or want a second opinion, we have you covered! Originally from South Africa, Dr. Bernstein and his incredible team are WILD about making a difference in the smiles they create, the lives they touch and the communities they serve! Finally, orthodontics designed with YOU in mind. Our orthodontist in Santa Rosa and Windsor uses hi-tech braces to achieve amazing results faster than ever before! Our orthodontic office is friendly, comfortable and fun so come in and experience a new kind of orthodontic experience! They are extremely professional and a joy to work with! They were always on time getting us into our appointment which is a major plus and my daughters teeth look amazing. 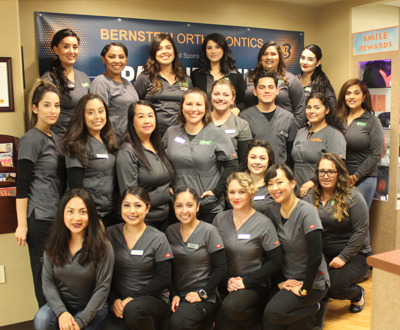 Dr. Bernstein and his staff are all amazing! Monica really took her time to chat with Jaden and explain everything she was doing! Thank you!! We absolutely love Bernstein orthodontics!! Dr.Bernstein is the best and the whole staff is so wonderful. Every visit was always a very plesent experience, very welcoming, friendly and very professional at the same time. I had an absolutely awesome experience at Bernstein! The staff was so fun and friendly and I love my amazing smile now. If your looking for a great place for ortho care I highly recommend Dr. Bernstein and his staff! Both of my children have gotten their braces here & service is always amazing. 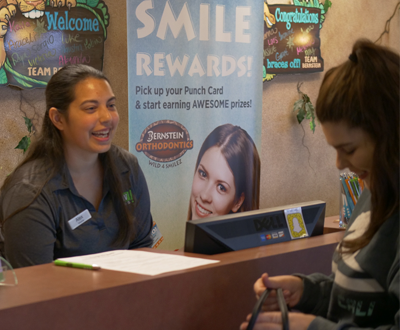 The kids have fun and love coming here and the rewards program is great incentive for the kids to take care of their braces willingly!